I went home recently and thought I would share some pictures I took with you. I'm back in Dublin now and back to reality, I miss the country and being at home... It is so beautiful. Sorry for the photo heavy post, but I hope you enjoy the pic's! A 90's throw back, however some would say it never went out of fashion (myself included). Pick it up in accessories like scarfs or if you want to go the whole hog you can find it in coats, trousers, and jumpers. 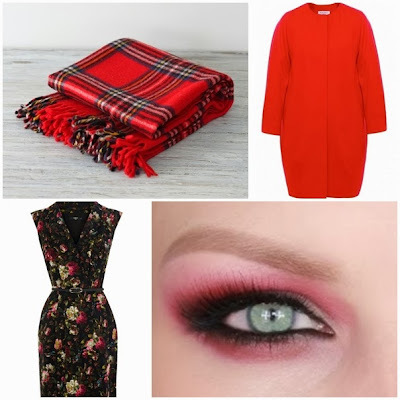 It can be more subtle in navy and black or go bright and traditional in this bright red. these shapeless coats are back in this year, it's not a trend I'm a huge fan of but you can't deny it will definitely keep you warm. It has transferred from catwalk to high street and is hugely popular. Floral although prominent in the summer it comes in the form of deep and darker colours to satisfy our flowery needs during autumn and winter. This Oasis dress is a perfect example of the feminine trend. Popular on catwalks and wearable for us every day folks in a subtle form, I think this can look lovely on anyone if you can find the shade to suit you. Mac's Cranberry can work really well as a wearable alternative to a solid red. Sequins always make an appearance at winter and this years no exception skirts, tops, and even jumpers will be bling-ed out for your enjoyment. My favourite A/W trend is berry lips, it can look great on anyone, just have the confidence to go bold and get the right colour for your skintone. I love Mac's Rebel and Sleek's Cherry. 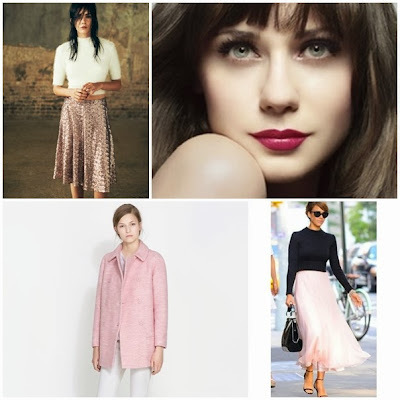 Pink/Blush Pink. You can do no wrong if your wearing some pink this season. Its pretty, girly and all over the high street. Popular a couple of years ago and back in this year. These skirts can really flatter a figure by accentuating the waist. By just showing your ankle these skirts can make your legs look longer and thinner. What trends will you be rocking this A/W? 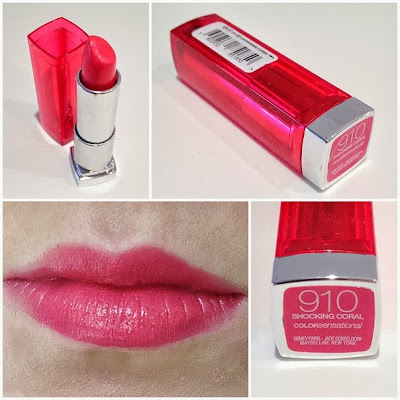 today's lipstick love is Maybelline's Colorsensational in Shocking Coral. I've never picked up a coral coloured product before, being quite pale I think it is a hard colour to pull off. Coral looks stunning on dark and olive skins but I just couldn't seem to find one that I thought suited me. However I wanted to try something a little different and I was immediately drawn to this. Although it looks quite red toned in the pictures it's a very bright almost neon pink toned coral, and probably as close to a coral as I'm ever going be able to wear. The bright colour offsets from the orange making it more wearable for anyone with pale skin. It is quite a hard lipstick yet it doesn't feel drying on, if anything it is on the moisturising side. The packaging is seriously cute from the neon acrylic to the little mirror at the top, for topping up throughout the day. The whole Colorsensational range looks amazing and there's a few more colours I definitely have my eye on, including a bright pink. I think I'm finally starting to break away from my constant nudes and neutrals! Have you been trying any bright lipsticks lately? today's mid week must have is an amazing body moisturizer. This product is a seriously epic moisturiser, which coming from someone who is a terror for using them is a huge statement. As I said I am terrible for using body moisturizers despite my dry skin on my legs and arms, and I really really have to like a product to make the time for it in my routine. 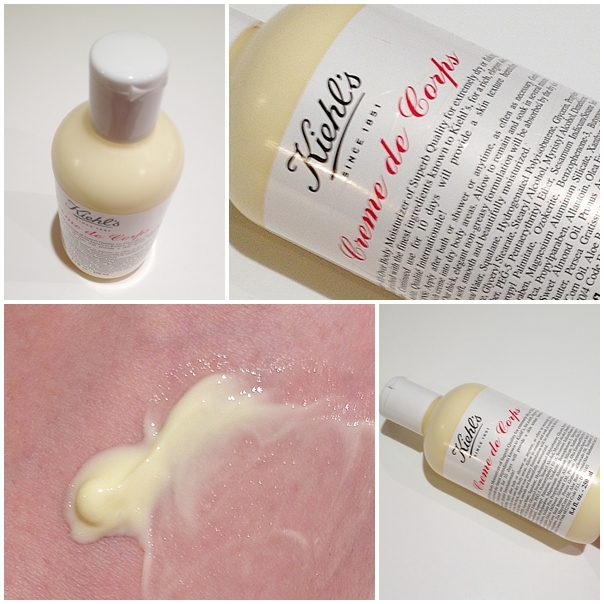 Its on the pricey side but worth every cent as it's highly moisturising and sinks into skin, leaving it super soft. It is a strange consistency as it is a thin cream but seems to thicken as you rub it in, the only thing that I can compare it to is cornflour... the same way that thickens with more movement applied. The packaging is clinical and to the point which I like, if you've read my blog before you will know I always say that a good product doesn't need lots of fancy packaging. Its definitely a mid week must have if not an essential, especially for those of you with dry skin! Whats your favourite body moisturizer? while talking to the lovely Kathleen from Squidgy Moments on Twitter a few weeks ago we decided to make a resolution for September... To discover some new blogs. The conversation grew and we decided to do a collaboration blog post, where we discuss two new blogs each that we have recently discovered and would recommend to each other. Two see the other half of this post you should take a trip over to Kathleen's lovely lifestyle blog (which by the way I highly recommend to everyone) and see what blogs I recommended for her (HERE). 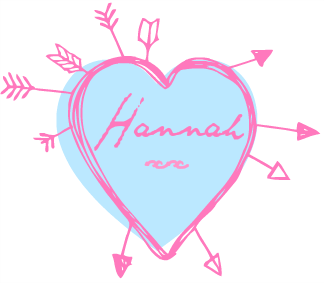 Kathleen Says "My first recommendation for Hannah is ‘Lilli White Rose’, A blog I somehow only managed to discover a couple of weeks ago! What I love about this blog is that it’s so relatable. The posts are real and honest and there is such a variety as well, which is important to me. The reviews on this blog are great and the lifestyle posts are super too! 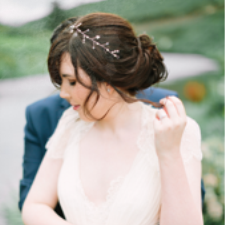 A fabulous must read Irish blog for those who have yet to visit it!" Kathleen Says "My second recommendation for Hannah is ‘Sleek-Chic’, I only just discovered this blog and I love the mix of fashion and beauty posts. Nicole also shares posts on days out which I find quite fun as you get the see the life of the person behind the blog!" A recent blog discovery is "megssays", I love Megan's blog because she does great reviews of products I'm genuinely interested in with swatches which I love to see in a review. Also I really like the layout of the blog its clean, pretty, and uncluttered. Lastly Megan just seems like a genuinely lovely person which makes it even easier to read her blog! I recently discovered this blog during a #bbloggers chat and I had to include it, I think Olivia's photography is awesome. Its the most creative and pretty way of photographing products I've ever seen. She always arranges the products in a cool way and usually some kind of still life form or different background. Definitely a blog for anyone looking for inspiration or a good review. To see my recommendations for Kathleen visit her blog HERE, She is a genuinely lovely person who works hard on her blog and puts a lot of effort in. 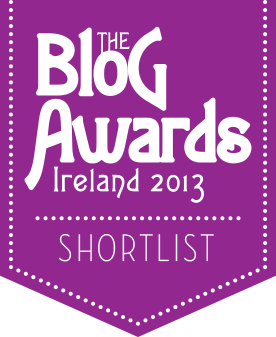 I would also like to congratulate her on being shortlisted in the Blog Awards Ireland which is much deserved! 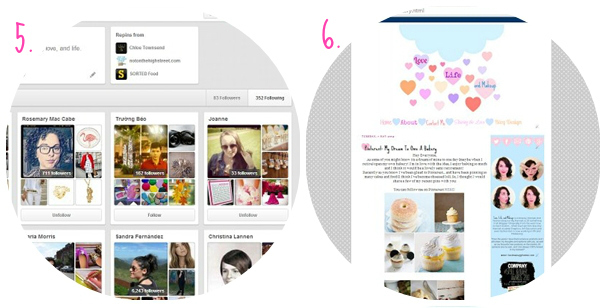 What new blogs have you discovered this month? I had another post planned for today because I didn't expect to be writing this but OMGoodness thank you so much everyone. I found out in the early hours of this morning that I have been shortlisted for Best Beauty/Fashion Blog in The Blog Awards Ireland 2013! With so many other amazing blogs on the list I'm totally shocked that I made it to the shortlist, I really appreciate it and am so thankful to have made it this far! Good luck to the other ladies, I wish you all so much of luck! If you would like to check out the shortlist you can do so HERE! My mid week must have for this week is the Blank Canvas Hot Pink HD F20 Foundation Brush (wow that's a mouth full). I do love my brushes and this is know exception. If you have been reading my blog for a while no doubt you would of seen previous posts about how great and affordable I think Blank Canvas brushes are! I can't not love the colour, what girl wouldn't? with the bright pink brush handle. However I have not been using this as a foundation brush, for me I prefer a denser brush for my foundation application. I have been using this as a blush brush and it now a staple in my collection. If like me you can tend to be slightly heavy handed then this is amazing. Its long soft bristles don't pick up as much product as my other harsher brushes. Meaning I'm able to build up colour rather than applying to much in one application, and looking like I have scary doll cheeks. What I also love about this brush is the small flat bottom, it is a great surface for applying to the cheeks. A lot of other brushes I usually use for my cheek area are quite large, therefore I can sometimes end up with product all over my face. 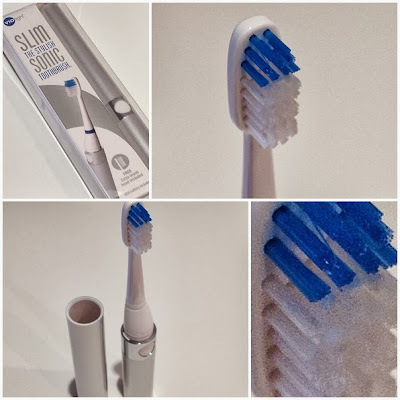 This is small enough to be the perfect size for the apples of my cheeks but could also be used as a great contour brush. I also love this brush for cream blushers as its soft enough to be able to buff the product into your skin. An all round affordable blush brush, going into my favorites (yes I have a brush holder for my favorites)! I also want to mention that today I was picked as a finalist in the RSVP Magazine and Oasis Ireland Style blogger 2013 competition which I am super excited about! I have had a huge smile on my face all day in excitement! They are putting up a different bloggers A/W post everyday from the 6th of September to the 6th of October on their website. The final is in October, which gives me something to look forward to! If you would like to see my post you can HERE! 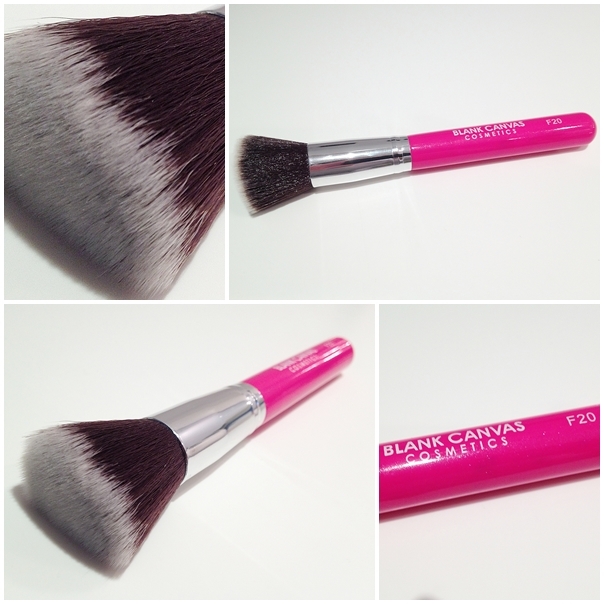 Whats your favourite blush brush? Today I was very lucky to be able to guest posted on Miss Budget Beauty. This month Mikhila is doing a month of "help a blogger out" which includes guest posts by bloggers like myself. I think this is such a fantastic idea! I want to say a huge thank you to Mikhila. Miss Budget Beauty was the first blog I ever discovered and the reason I started blogging myself so to be able to guest post is a huge honor. If you would like to view the post you can click HERE! 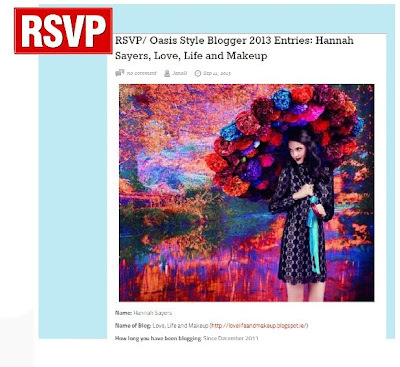 A couple of weeks ago during a Bloggers Chat on twitter I noticed Nadine was looking to guest post on a blog. I jumped at the chance for her to blog for me. Nadine's blog Rosy Blossom is brilliant and she's so lovely, so I would definitely recommend heading over to check it out! As I sure you all know, summer has well and truly ended and September has approached very quickly and although the English summer isn't always the best, I have enjoyed my summer holidays nonetheless. With only a few days left until I have to back to school for one the most important years in my school life, I have found myself spending a lot of time this week shopping for school uniform and stationary and other necessary equipment and of course no shopping trip is complete with popping into Boots to pick up a few more things for my makeup bag :-) If your school is like mine then you probably won't actually be allowed to wear makeup to school but what makeup loving teenage girl is going to be caught not wearing any makeup?! Hardly any is my guess, but since I also don't like getting in trouble I have spent a lot of time creating the perfect natural, no-makeup makeup look that not only let's me feel comfortable while at school, but is very affordable for people on a pocket money budget. To create the look, start with the Collection 2000 Lasting Perfection Concealer to cover up any dark circles and blemishes. 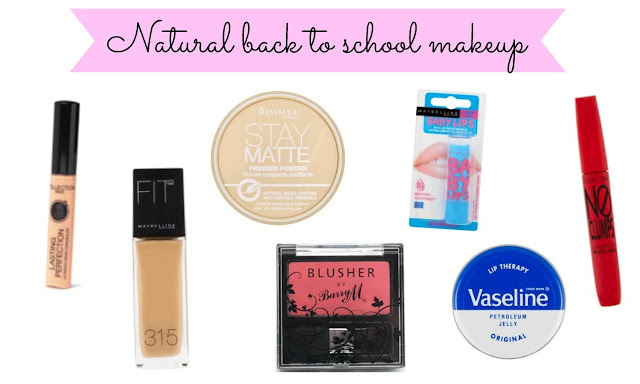 You don't want to be wearing any heavy foundations to school because it will just feel uncomfortable and you probably don't need it any way. I love this concealer because it really does conceal everything that you want to conceal and it will stay put all day long so you don't have to worry about reapplying throughout the day. If you really can't go without a foundation then I recommend using the Maybelline Fit Me liquid foundation because it has a sheer/medium coverage and looks and feels very natural on your skin. The next step is to powder using the Rimmel Stay Matte Powder. You can go for a coloured powder or you can just stick to translucent if you want. I like to use the shade Sandstorm if I am not wearing any foundation underneath because it adds a bit of colour to my face. This is honestly the best powder that I have ever used and it is great of you have quite oily skin like me because it minimizes pores and lasts for ages. After you have powdered the next thing you want to do is add blush. I like to use the Barry M blusher in Rose. This is a very natural pinky colour and it looks great with my skin tone. It is very important not to overdo it though and you should remember to leave a two finger gap between your nose and where you start your blush to ensure a natural look. Now you have finished with the face it is time to move onto the eyes. I don't really have a favourite mascara but the one I've been using a lot recently is the Collection No Clumps mascara. This mascara is great for school because it separates the lashes and gives a lot of volume without clumping or looking spidery. If you think you can get away with wearing eyeliner, you can use the Rimmel London Soft kohl eyeliner to do a thin line on your lid to make your lashes look thicker and fuller. I would avoid doing the waterline because it won't look natural and you will probably get caught. I would also use a brow comb to brush through your brows to make them look neat and tidy. To finish off the look, I usually just stick to some Vaseline or if I want some colour I will use a tinted lip balm. 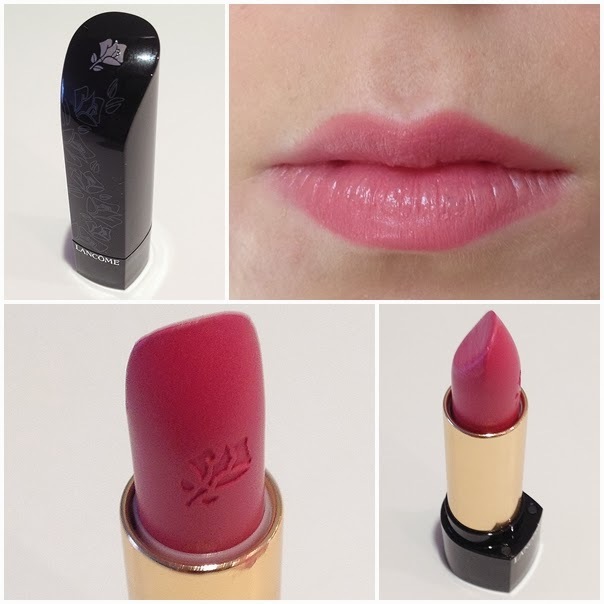 I have been loving the Maybelline Baby Lips recently and you can use any colour you want. And that is the finished look! It is very natural and very pleasant to wear during a long day at school. All these products are priced under £5 which makes it a very affordable look and suitable to for all ages. I hope you enjoyed this back to school post and I want to thank Hannah again for letting me post on her blog. Let me know what products you use in your school makeup looks. I hope you have a great week and I will talk to you soon! 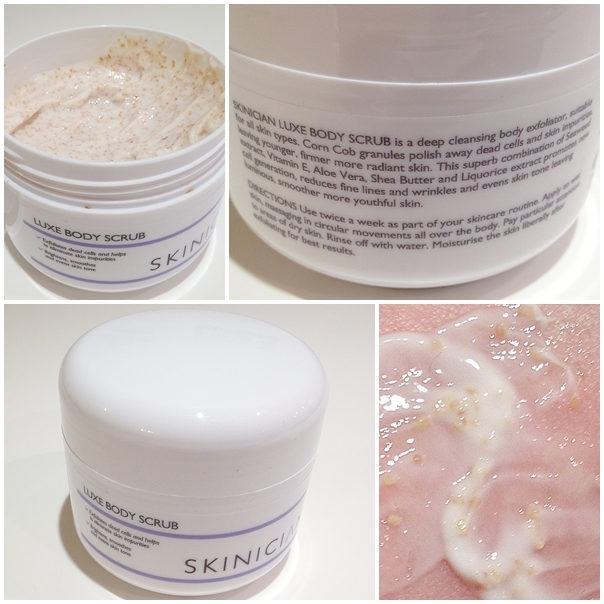 today's mid week must have is Skinician Luxe Body Scrub. I've never really enjoyed scrubs I have always thought of them as a chore another thing to do in a evening, until now! This is a recent discovery, I only started using this scrub a couple of months ago but I'm already in love. I can sometimes suffer with ingrown hairs from constantly shaving my legs so I was in the market for a good scrub! It smells amazing and contains all the good stuff like Seaweed, Vitamin E, Aloe Vera, and Shea Butter. This is most definitely a body scrub I wouldn't let it anywhere near my face, its way to gritty for that but for the body it is amazing! You use this scrub by applying to wet skin and massaging it in circular movements to exfoliate the dead skin. Its quite a creamy formula with large granules of corn cob. It is suitable for all skin types, however I would say if you have dry skin to make sure you follow up with a hydrating moisturizer because I find it can sometimes increase the feeling of dry skin on my legs. The packaging is quite clinical but I like that, its simple and minimalist... The product is good enough that it doesn't need over the top packaging. What is your must have exfoliater? I love Pinterest and I find it a huge help in many different ways when it comes to Blogging... So I thought I would share these tips with you and hopefully someone else finds them useful. 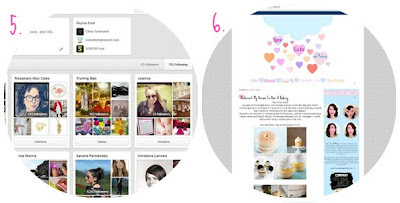 Link your Blog to your Pinterest account. If people like your pins they might like your Blog. Click edit your profile, then link with your Website/Blog... You could even choose your Blog name as your Pinterest username (if its available of course), making a recognizable connection. 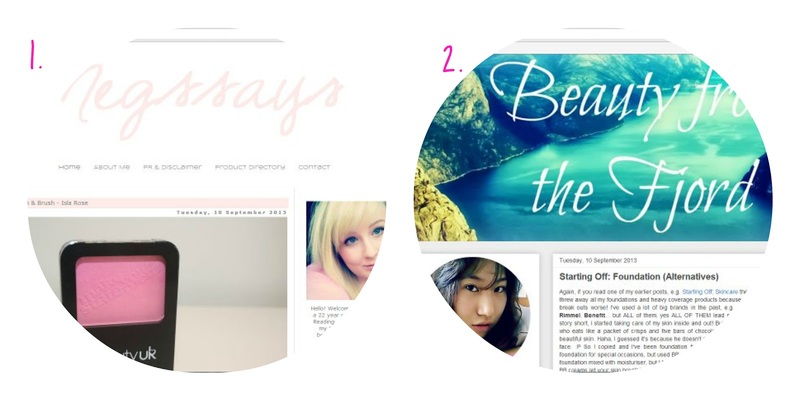 By uploading images from your Blog and linking them back if someone repin's your image your link is spread. You can link your Blog to an image by first uploading it to your board, then clicking the edit symbol on the pin and adding the URL. I would suggest adding the exact Blog post URL that the picture came from, therefore if someone wants to check out the post they only have to click on the picture. 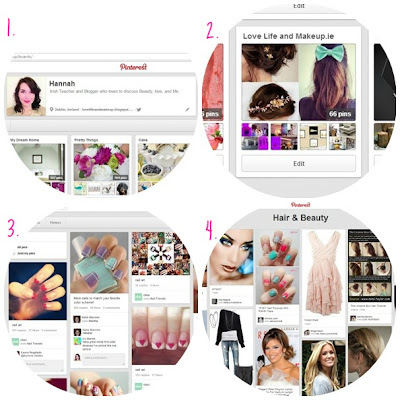 Browse Pinterest for Blog post inspiration. Pinterest has so many pins you will find inspiration in a number of places. By clicking the button next to the search bar in the top left hand corner multiple options appear/image categories. 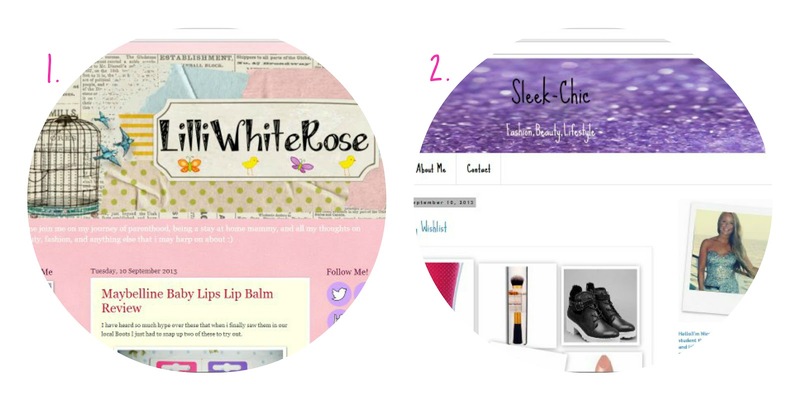 There is even a DIY & Crafts page for the arty Bloggers out there. Writing a post which you need images for? Whether its a inspirational quote or a bunch of flowers it can probably be found on Pinterest. You can use the search bar to find images, just don't forget to link the image source back to where you found it. Follow fellow Bloggers as well as random boards you like and they might follow you back. Every image you upload has a possible link to your Blog so its a great way of networking. Blogging about Pinterest might seem strange but if you like imagery it can be a great post. Include images you love that week, month etc... It gives people an opportunity to learn about Pinterest, also that you are on it, and you get to use lots of pretty images. Have you got Pinterest? How do you use it for Blogging?